I've enabled "moderate comments before publishing" for the next week so no-one can copy anyone else! There will be a small prize for one person picked at random from the guessers. People who posted a picture will get one chance for that and another chance if they make a guess too. 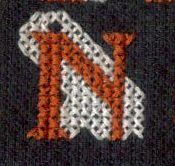 This is an old piece, stitched sometime in the 1990s. 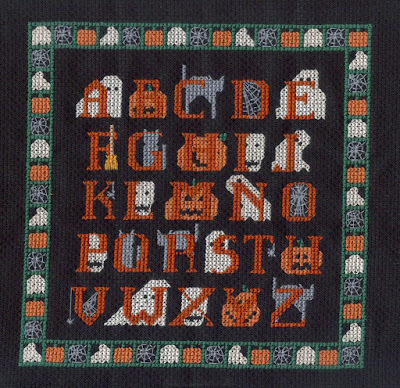 The ABC and border came from a book by Better Homes and Gardens called "Cross Stitcher's Big Book of Alphabets and Borders". And yes, it does exactly what it says on the tin!! I have used this book alot. I centralised the alphabet and changed the shape behind the L to another skull rather than a beige paper bag with a white thing sticking out the top. The finished framed piece now lives in the Large Boy's room. Finally, don't forget, some of us are on different time zones so if you visit a blog and can't find a letter or picture yet, pop back later in the day. The competition is open for one week closing 00.01 hours 7th November GMT. - Competition now closed! I think the phrase us 'Witch's Couldron. Thanks for the little puzzle it was great visiting all those other blogs. Love your Sampler. Very cute. thank you for so much fun deary..
That was fun, I've found some great new blogs I hadn't seen before. Both the Cs are missing but I'm going to go with "Witch's Cauldron"
Have a great Halloween ! That was fun! The phrase is: "Witch's Cauldron"...Thanks for putting this together! Hi Jo. That was fun. I don't have a blog, but it was fun to play along. Hi hon. What fun that was. I found some new blogs. BTW the link for Blue Star Stitcher sends you to her mail not her blog and she doesn't have a letter posted. Hi Jo! I love when you do these blog hops. And my answer is Witch's Cauldron!! Not bad considering the C blog isn't even out yet. Hahahaha Happy Halloween!!!! What a fun idea! And a great chance to visit some wonderful blogs! Oh!!! I know the answer.. Witch's Cauldron. Oh how fun. Loved the blog hop! Witch's cauldron! Hi Jo, such a lot of fun - you are so clever the way you organise the blog hops - very creative. I hope you don't mind I substituted a fabulous skull cake made by a friend of mine for another friend's birthday - it really seemed perfect for this. Happy Halloween! I have enjoyed visiting some new to me blogs. Thank you Jo for organising this. I think the mystery phrase is 'witch's cauldron'. Can't wait for the Christmas signups..hint hint!!!!! Thank you so much for the fun! I'm guessing Witch's Cauldron. :) Cathryn (blueladie at hotmail dot com). Have a terrific Halloween!!! At least I'm pretty sure that is what it is. When I click on Blue Star Sticher, it is a link to email that blogger. So I guessed on that letter. Thank you for doing this, much fun! I also found more bloggers to follow! I finally got the phrase, I think... it looks like it is WITCH'S CAULDRO which translates to witch's cauldron. Were we short of participants? Happy Halloween dear Jo! Thank you for hosting the blog hop. I agree with cucki - it's such a lot of fun!!! I came to your blog from Shebafudge and so glad I dropped by. Looks like you get up to lots of fun and I hope to read all about it so am now 'following you'. Thank you for hosting this wonder blog hop. it was so much fun to see so many beautiful halloween stitchings !! 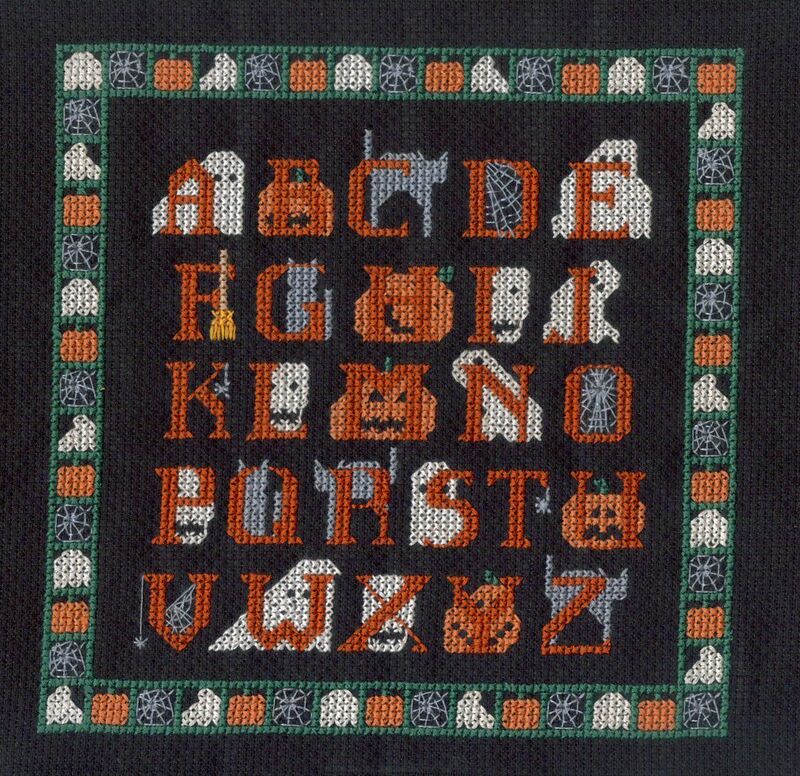 I love your halloween sampler ! I have that BH&G Alphabet book too. Good stuff. OK first of all i have loved reading all the blogs that I wouldnt have found normally i have commented and followed them all, so thanks for doing this, I hope you do another soon! and thirdly the mystery phrase is witch's cauldron. i couldn't do it this time due to having major problems with the eldest and being away form the land of internet but next time you do a hop along i am in! Hi Jo, I have finally found time to follow the blog hop trail and I have found out that the phrase is "Witch's Cauldron". Thanks again for hosting the blog hop, I found some lovely new blogs.